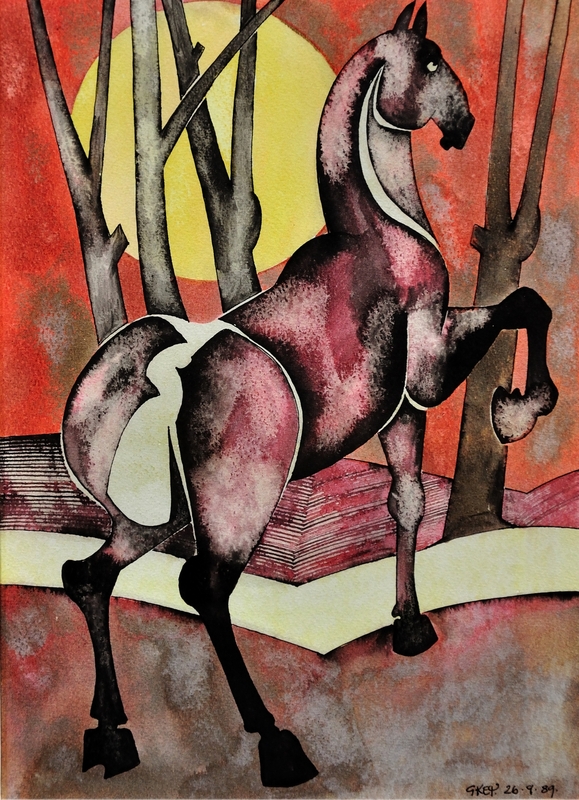 Geoffrey Key - Horse with rising sun, 1989 - Online gallery supplying original fine art. Trending Modern British and Contemporary Welsh. Available for sale from Big Sky Fine Art; this original painting by Geoffrey Key dated 26th September 1989.<br> The work is presented and supplied in a sympathetic and contrasting contemporary frame to suit the subject colouration, mounted using conservation materials and behind glass. <br> The watercolour drawing is signed and dated lower right.<br> <br> Geoffrey Key is a leading figure in Northern contemporary art, widely regarded as Lancashire’s greatest living artist, noted for his realism, his expressive use of bold colour and his graphic, linear style. His striking works, now much in demand, have established him as a major player of post war British figurative art<br> <br> Geoffrey Key was born in Rusholme, Manchester in 1941. His mother, Marion, worked as an illustrator and encouraged him to draw and he took to this easily and with great enthusiasm. He was educated at Manchester's High School of Art, whose headmaster, Ernest Goodman, established the Salford Art Club. It is fitting that many years later, after Goodman's death, its members chose Geoffrey Key as Honorary President. In 1958 Key enrolled at the Manchester Regional College of Art, where he was tutored by the sculptor Ted Roocroft and the painter Harry Rutherford, both of whom influenced him greatly. After gaining the National Diploma of Design and the Diploma of Associateship of Manchester, the latter with distinction, Key took up a postgraduate scholarship in sculpture. <br> <br> His academic awards include the Heywood Medal in Fine Art and the Guthrie Bond Travelling Scholarship.<br> <br> Geoffrey Key’s early work included an important period of development during which he concentrated on painting and drawing a specific area of the Derbyshire landscape, the Whiteley Nab hill, south of Glossop. Key created literally hundreds of images of this one landscape and later revealed that the sole purpose of this dedicated period of study, was to build upon the firm foundation established by his academic training, whilst divesting himself of the influences he had absorbed in order to arrive at his own personal artistic language. In other words, this is where he found his own style.<br> <br> After graduating Key worked as a teacher at Duke Street Secondary Modern in Broughton, Salford, which later became Broughton Modern. In every spare moment though he painted and his talent was quickly recognised. As the likes of Salford Art Gallery, The Rutherston Loan Collection and North West Arts began to acquire his work he made the decision to relinquish his salary and to become a full time artist.<br> <br> Key was elected to membership of the Manchester Academy of Fine Arts in 1968 and was a prize winner in 1971. During this time he was also commissioned by three North West England based companies – Mather & Platt, Richard Johnson & Nephew, and Wilson’s Brewery. The Richard Johnson & Nephew pictures are now held by the Museum of Science and Industry, Manchester.<br> <br> In the 1980s the French company Société des Caves de Roquefort also commissioned Key’s work and further successful exhibitions were held in both the UK and abroad. In 1987 the Manchester Evening News asked Key to write an article on L. S. Lowry, who Key had known well, for a feature marking the centenary of the artist's birth. This article was accompanied by a contemporary drawing of Lowry by Key. Apart from LS Lowry, Key is arguably Lancashire’s best-known and most collected contemporary artist. Key says ‘I knew Lowry and he was a lovely, lovely man. But he did not like my work and I did not like his!’ <br> <br> In the early 1990s Key visited Hong Kong to exhibit his work in a gallery at the Mandarin Oriental Hotel. He says that this first visit to Asia, was to prove a catalyst in a change in the use of colour in his work. An earlier predominance of muted tones was replaced with a fuller and more vibrant palate, which has remained an enduring aspect of his art. Of the exhibition, Asian Art News said "It is the emotion and pleasure of making art that comes through so clearly in Key's work and makes it sparkle".<br> <br> Key’s career as an artist now spans over five decades. As his style has developed he has acquired a significant following of admirers and collectors in the UK and abroad. His work has been and widely appraised and reviewed and features in several public art collections in the northwest of England, including the Salford and Manchester Art Galleries, who now hold over 70 of his works. <br> <br> Key’s work is also held in private and corporate collections including National Westminster Bank, Mandarin Oriental Hong Kong, Jockey Club of Hong Kong, Chateau de St Ouen and Perrier. He has represented the UK in invited exhibitions in Europe. Shows have taken place across the UK, Europe, Asia, Australia and the USA and his work is exhibited and sold in galleries in the UK, Ireland, Sydney, France, Germany, the US and Hong Kong.<br> <br> In May 2013 Key's work was exhibited at Messum's Art Gallery in Cork Street, London to much critical acclaim and nearly sold out; he does not know who bought the three pictures which were sold to Beijing, or the three that were bought by Moscow but he does know that The Who’s Pete Townshend also bought one. ‘That was my highlight,’ he said. Prices for Key's work have risen steadily throughout his career, but never more so than over the last decade.<br> <br> The process by which Key produces his paintings has been likened by him to meditation; he describes himself as being “on a totally different planet”. In preparation for a still life picture he will set the subject objects, look at the composition and then put them away and paint from memory. He also does little doodles or sketches when he is out and about to supplement his memory notes. He says that he has a fear of copying and that you can get a camera to do that! ”I find the mind’s great at distilling, at breaking down into essentials. If I’m looking at it I find myself copying every detail, and that isn’t necessary.” He sees the structure of a picture as more important that the subject matter, whether a figure or a landscape. If a picture is not quite right, Key will destroy it, and does so with one almost every month. He insists, ”I never let a picture go unless I am totally happy with it”<br> <br> Key’s work is always visually stunning. His bold colourful style is instantly recognizable. He paints with freshness, humour and great technical aplomb. His landscapes are practically sculptured and vibrant with colour, restrained by a confident handling of line and form. His images of horse and rider merging into one are mesmerising, unlike any other equestrian work and almost the stuff of fantastic dreams. His figurative work is also superb, particularly his women, with proud strong figures oozing sensuality. He manages to combine imagination, genuine affection and technical brilliance. From the late nineties through to the present day he has pursued a fiercely guarded independence of expression and style, which has produced works of skill, creativity and integrity.<br> <br> Key has published a number of books – G. Key, A Book of Drawings and Interview (1975), Daydreams (1981), Clowns (2001), Geoffrey Key Twentieth Century Drawings (2002), Images (2004), Geoffrey Key Paintings (2008), Birds (2010). Signature Book (2011).<br> <br> In 2011 Key was filmed for a documentary about his work and life by Andy Pacino, a filmmaker and author from Manchester. It has the working title Saltglaze Pot.<br> <br> Now in his mid seventies, Key still has a home and studio in Salford, which he shares with his long-term partner Judith. They moved to a bigger house when he was 70 as he needed a larger studio, and he continues to paint, using sardine tins as palletes! He works in solitude, listening to music. Geoffrey Key himself is a singular, colourful character, jovial and modest; his work reflects a consuming interest in the wider world and an affirmative engagement with art and with life. <br> <br> This stylised pen and wash watercolour is almost Japanese in its aesthetic feel and inspiration. It depicts a rearing horse against a simple landscape of fields, with bare tree trunks behind and a huge setting sun illuminating the whole. The horse is shades of purple and black, the sky red and the sun is clear yellow. It is a bold and colourful image, powerful and elegant. Very Geoffrey Key! Available for sale from Big Sky Fine Art; this original painting by Geoffrey Key dated 26th September 1989. The work is presented and supplied in a sympathetic and contrasting contemporary frame to suit the subject colouration, mounted using conservation materials and behind glass. The watercolour drawing is signed and dated lower right. Geoffrey Key was born in Rusholme, Manchester in 1941. His mother, Marion, worked as an illustrator and encouraged him to draw and he took to this easily and with great enthusiasm. He was educated at Manchester's High School of Art, whose headmaster, Ernest Goodman, established the Salford Art Club. It is fitting that many years later, after Goodman's death, its members chose Geoffrey Key as Honorary President. In 1958 Key enrolled at the Manchester Regional College of Art, where he was tutored by the sculptor Ted Roocroft and the painter Harry Rutherford, both of whom influenced him greatly. After gaining the National Diploma of Design and the Diploma of Associateship of Manchester, the latter with distinction, Key took up a postgraduate scholarship in sculpture. His academic awards include the Heywood Medal in Fine Art and the Guthrie Bond Travelling Scholarship. Geoffrey Key’s early work included an important period of development during which he concentrated on painting and drawing a specific area of the Derbyshire landscape, the Whiteley Nab hill, south of Glossop. Key created literally hundreds of images of this one landscape and later revealed that the sole purpose of this dedicated period of study, was to build upon the firm foundation established by his academic training, whilst divesting himself of the influences he had absorbed in order to arrive at his own personal artistic language. In other words, this is where he found his own style. After graduating Key worked as a teacher at Duke Street Secondary Modern in Broughton, Salford, which later became Broughton Modern. In every spare moment though he painted and his talent was quickly recognised. As the likes of Salford Art Gallery, The Rutherston Loan Collection and North West Arts began to acquire his work he made the decision to relinquish his salary and to become a full time artist. Key was elected to membership of the Manchester Academy of Fine Arts in 1968 and was a prize winner in 1971. During this time he was also commissioned by three North West England based companies – Mather & Platt, Richard Johnson & Nephew, and Wilson’s Brewery. The Richard Johnson & Nephew pictures are now held by the Museum of Science and Industry, Manchester. In the early 1990s Key visited Hong Kong to exhibit his work in a gallery at the Mandarin Oriental Hotel. He says that this first visit to Asia, was to prove a catalyst in a change in the use of colour in his work. An earlier predominance of muted tones was replaced with a fuller and more vibrant palate, which has remained an enduring aspect of his art. Of the exhibition, Asian Art News said "It is the emotion and pleasure of making art that comes through so clearly in Key's work and makes it sparkle". Key’s career as an artist now spans over five decades. As his style has developed he has acquired a significant following of admirers and collectors in the UK and abroad. His work has been and widely appraised and reviewed and features in several public art collections in the northwest of England, including the Salford and Manchester Art Galleries, who now hold over 70 of his works. Key’s work is also held in private and corporate collections including National Westminster Bank, Mandarin Oriental Hong Kong, Jockey Club of Hong Kong, Chateau de St Ouen and Perrier. He has represented the UK in invited exhibitions in Europe. Shows have taken place across the UK, Europe, Asia, Australia and the USA and his work is exhibited and sold in galleries in the UK, Ireland, Sydney, France, Germany, the US and Hong Kong. In May 2013 Key's work was exhibited at Messum's Art Gallery in Cork Street, London to much critical acclaim and nearly sold out; he does not know who bought the three pictures which were sold to Beijing, or the three that were bought by Moscow but he does know that The Who’s Pete Townshend also bought one. ‘That was my highlight,’ he said. Prices for Key's work have risen steadily throughout his career, but never more so than over the last decade. Key’s work is always visually stunning. His bold colourful style is instantly recognizable. He paints with freshness, humour and great technical aplomb. His landscapes are practically sculptured and vibrant with colour, restrained by a confident handling of line and form. His images of horse and rider merging into one are mesmerising, unlike any other equestrian work and almost the stuff of fantastic dreams. His figurative work is also superb, particularly his women, with proud strong figures oozing sensuality. He manages to combine imagination, genuine affection and technical brilliance. From the late nineties through to the present day he has pursued a fiercely guarded independence of expression and style, which has produced works of skill, creativity and integrity. Key has published a number of books – G. Key, A Book of Drawings and Interview (1975), Daydreams (1981), Clowns (2001), Geoffrey Key Twentieth Century Drawings (2002), Images (2004), Geoffrey Key Paintings (2008), Birds (2010). Signature Book (2011). In 2011 Key was filmed for a documentary about his work and life by Andy Pacino, a filmmaker and author from Manchester. It has the working title Saltglaze Pot. Now in his mid seventies, Key still has a home and studio in Salford, which he shares with his long-term partner Judith. They moved to a bigger house when he was 70 as he needed a larger studio, and he continues to paint, using sardine tins as palletes! He works in solitude, listening to music. Geoffrey Key himself is a singular, colourful character, jovial and modest; his work reflects a consuming interest in the wider world and an affirmative engagement with art and with life. This stylised pen and wash watercolour is almost Japanese in its aesthetic feel and inspiration. It depicts a rearing horse against a simple landscape of fields, with bare tree trunks behind and a huge setting sun illuminating the whole. The horse is shades of purple and black, the sky red and the sun is clear yellow. It is a bold and colourful image, powerful and elegant. Very Geoffrey Key!